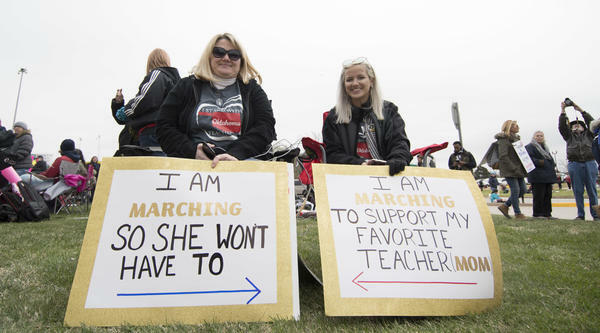 Thousands of Oklahoma teachers and supporters rally in the state's capital. When Evan Taylor heard that Oklahoma teachers planned to walkout, he converted his small Tulsa church into a "glorified daycare" furnished with board games, crafts and a movies to keep kids entertained. For the last nine days, Taylor, a minister at East Side Christian Church, has hosted between 12 and 60 children with the help of three to five volunteers. In addition to offering childcare, the church is also one of the 73 meal distribution centers in Tulsa providing meals to hungry students who would normally rely on school cafeterias to feed them during the week. "Organizing volunteers, signing up for food services and keeping a mix aged group of kiddos entertained has been no simple act, but I'm proud to do it," Taylor, a father of three, wrote to NPR in an email. "My kids are worth it, my teachers are worth it. My state is worth it." Taylor is one of the hundreds of Oklahoma NPR listeners who responded to our recent callout: How are you as a parent dealing with Oklahoma's teacher walkout? Many parents responded, most showing their unyielding support of the movement, noting that teachers were not just demanding a pay raise for themselves, but also funding for better textbooks and classroom supplies. The walkout is a "little inconvenient, but nothing in comparison to what our teachers face every day in underfunded classrooms and abysmal salaries," Kristen Palfreyman of Broken Arrow, Okla., wrote in a Facebook comment. "Hold steady teachers or we won't have proper education funding for decades more." Perhaps the biggest obstacle for parents is figuring out what to do with their kids during regular school hours. Oklahoma parents can use guides like the one made by Tulsa Area United Way to locate places for food, recreational activities and child care. Respondents say they rely on extended family and pop-up daycares to provide a safe place for their kids to go during the day. But finding adequate care for students with disabilities can be a challenge. Josh Fearing teaches middle-school kids diagnosed with autism. Fearing knew his students' parents would have trouble finding daycare on short notice. So he reached out to a local church to provide a space for his students to stay during the day. For nearly two weeks, Fearing has worked to keep his kids entertained by organizing a pizza party and bringing the Oklahoma City Thunder's Rolling Thunder Book Bus for his students to pick out books. This is a just a "new school with old teachers," Fearing tells his students in an attempt to provide a sense of normalcy. "We are in a new place but it's still the same old faces." Fearing "has been a godsend to us," wrote Miranda Steffen, a parent of one of his students. "I was able to work last week and today," she says. "I was able to go up to the capital with my 6-year-old so he could see politics in action." Despite the child care shuffle, many parents were enthusiastic about the surge of activism, optimistic this momentum can be channeled into voting booths. "November can't get here soon enough," wrote Lauren Florence of Oklahoma City in an email to NPR. Other parents participated in the protests. Holly Anderson of Norman, Okla., took her kids to the state Capitol to bring bagels and coffee to their teachers. "I trust the teachers with my child's life, how could I do anything but support them," Anderson wrote in an email. "They aren't asking for anything unreasonable. They are just asking to make a livable wage and the tools they need to do their jobs well. They deserve all of it." Emily Wendler reported this story for radio and Erin B. Logan reported for web. Schools across Oklahoma have been closed for nine days and counting. Teachers are rallying at the state capitol. They want more school funding. A deal with lawmakers could be close, but until then, many teachers will not go back to their classrooms. We've heard from parents across the state who say they support the teachers, but they are also scrambling to make things work at home. Emily Wendler with StateImpact Oklahoma has the story. EMILY WENDLER, BYLINE: Nine days of a teacher walkout means nine days of headaches for parents trying to figure out where to take their kids. Turns out, the YMCA, Boys and Girls clubs, churches, even the Oklahoma City Zoo, hundreds of organizations in the state are providing childcare for parents and meals for their kids. WENDLER: The Girl Scouts has turned its western Oklahoma headquarters into a camp for the past week and a half. On Wednesday, day eight of the walkout, a group of girls were practicing a well-known Girl Scout song to perform later on in the day. UNIDENTIFIED CHILDREN: (Singing) That's how long I want to be your friend. WENDLER: And when it comes time to pick up their kids, I ask parents like Don Anderson. DON ANDERSON: Oh, this is fantastic. It's not only for me, for all the other parents, too. WENDLER: Anderson is a parent and teacher, and he's been bringing his two daughters here while he's been rallying at the state capitol. He says he realizes the walkout has been stressful for a lot of people, and he's got a little guilt about it. ANDERSON: I feel bad for all the parents. And I feel bad for the teachers. WENDLER: Another working parent, Zanade Morgan, who's been bringing her daughters here too. She says she exhausted her family resources by the end of the first week of the walkout, and she was excited when she heard about this Girl Scout camp. ZANADE MORGAN: It was very heartwarming to know that there are people out there that, you know, care about those parents who don't have anybody to care for their children. WENDLER: This walkout hasn't been easy, Morgan says, but she's still on the teachers' side. MORGAN: That is our funding, so I was excited for them. So I was like, hey, we'll figure it out. WENDLER: In fact, I heard that from a lot of parents, even in week two. SUSAN MAYBERRY: Everyone that I have talked to is totally for the teachers. ALEYSHA DAILEY: As far as I'm concerned, this is no different. It's an additional complication, sure, but the long term fallout to me will be completely worth it. BRITTANI GROESBECK: I'm all for whatever it takes. WENDLER: That's Susan Mayberry, Aleysha Dailey and Brittani Groesbeck. And a deal could be near. The teacher's union recently rolled back its demands. Instead of 150 million, the ask now is for lawmakers to raise another 50 million to end the walkout. That means parents could get a break soon - that is, until summer. For NPR News, I'm Emily Wendler in Oklahoma City. (SOUNDBITE OF ALICE COOPER SONG, "SCHOOL'S OUT") Transcript provided by NPR, Copyright NPR.